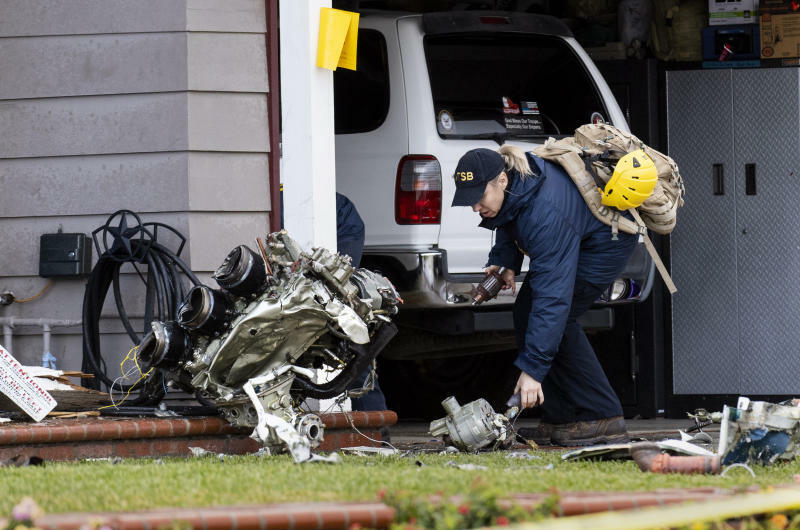 YORBA LINDA, Calif. (AP) — Authorities on Wednesday identified four people, including an 85-year-old man, who were killed on the ground when a small plane broke apart in the air and crashed into a Southern California neighborhood last weekend. The four victims were in a house that caught fire when parts of the plane rained down onto suburban Yorba Linda, the Orange County Sheriff's Department said. Coroner's officials identified them as Roy Lee Anderson, 85, and Dahlia Marlies Leber Anderson, 68, both of Yorba Linda; 48-year-old Stacie Norene Leber, 48, of Corona, California; and Donald Paul Elliott, 58, of Norco, California. Property records show Roy Lee Anderson and Dahlia Marlies Leber Anderson lived at the house that burned. The victims' relationships weren't immediately known. The sheriff's department released a joint statement from family members thanking first-responders and asking for privacy. "Our family bond is tight and each member lost in this tragedy represents more than just one role within our family," the statement said. "We lost parents, grandparents, great-parents, spouses, sisters, brothers, aunts and uncles. The home lost was a beacon for so many family and friends where many celebrations were held." Observers said the plane initially appeared intact when it fell through a cloud ceiling at an altitude of about 2,000 to 3,000 feet (600 to 900 meters), NTSB investigator Maja Smith said this week. Witnesses said the plane's tail and wings broke off as it plummeted.